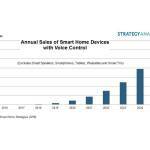 BOSTON--(BUSINESS WIRE)--Voice control has taken hold in the market thanks to the popularity of smart speakers, but it doesn’t end there in the smart home according to a forecast just released by Strategy Analytics . 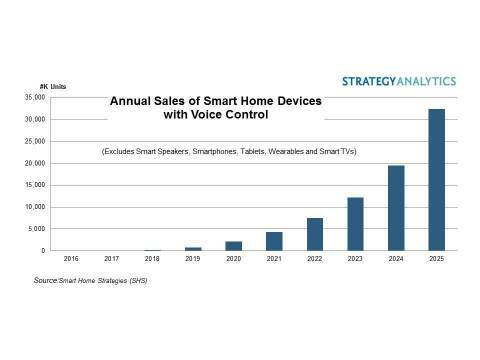 According to the report, “ 2018 Smart Home Devices with Voice Control ”, sales of smart home devices with voice control (excluding smart speakers) will leap from just 154,000 units in 2018 to 32.3 million in 2025. Honeywell’s voice-controlled Lyric thermostat, introduced at the 2014 CES, has since been joined by a number of firms including Samsung, Ecobee (See “ Ecobee's Switch+: a Sign of Things to Come in the Smart Home ?”) and most recently by Brilliant's new light switch. By 2025, smart appliances, surveillance cameras, and smart bulbs will be the most common types of devices with built-in voice control according to the report. The US, China and the UK will be the countries where voice-controlled smart home devices will be most popular by 2025. Many of the devices will have embedded digital assistants such as Amazon Alexa and Google Home, but the majority will not due to the extra cost involved. The forecast excludes devices that can be controlled by voice-based digital assistants, but do not have embedded voice input capabilities. Annual Sales of Smart Home Devices with Voice Control (Graphic: Business Wire).